This is a recipe from Rose Elliot’s New Complete vegetarian cookbook. I was kindly given permission to include it in the blog. It’s the first recipe I made from the book and I remember being struck by how such a simple dish could be so delicious. I was going to post it last September but then celery went out of season (its usually in season from June through to October) and I only really use fruit and veg that’s grown in the UK when it’s in season. 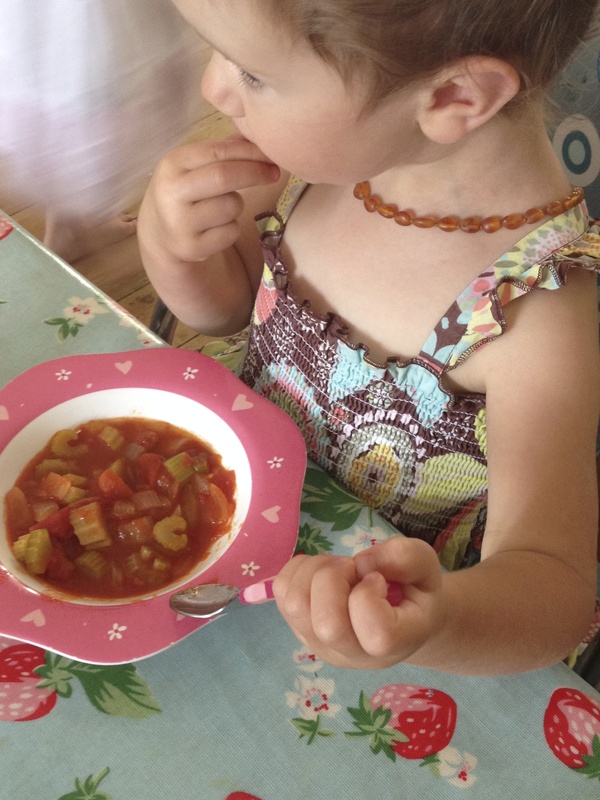 It’s part of my What’s for lunch series of recipes: ideas for simple meals to share with your baby and/or toddler. I would make this on a day when they were going to have a main meal at tea time that includes high quality protein (lean meat, fish, eggs, pulses and/or beans) or serve it alongside something that includes high quality protein like sardines on toast. When I gave it to my then 10 month old baby I gave it to her alongside a small leftover portion of meatballs and pasta as I wasn’t sure if she would like the soup (she did). I just wanted to give her some because I was eating it so it would encourage her to try it. I made this again recently and my eldest daughter didn’t like it – well she didn’t once she knew it had celery in it! She eats celery usually in soups or sauces but probably doesn’t realise. So I guess the moral of the story is fairly obvious – if you want your child to eat/accept a food make it part of their diet from a young age. Fry the onion and celery in a heavy bottomed pan until translucent for between 5-10 minutes, make sure they don’t brown. Add the garlic, tomatoes and water or stock. Simmer for about 30 minutes or until the celery is very tender. Make sure it’s cooled down before giving it to your little one.